Last week I voiced a hope for morebright nonsense on the screen, and this week Miracle on 34th Street was previewed for early release. It is a charming film, in part about a budding romance between Macy’s and Gimbel’s, but mostly about Santa Claus. The old gentleman (named Kris Kringle) is completely real, though the state of New York tries in a fine, big, foolish trial to prove he doesn’t exist. The point, developed quite deftly, is that if a few maladjusted people were able to prove Kringle daffy enough to be committed, they would have to prove most of the world crazy along with him. With Santa’s loving kindness gone, little children would wither, lovers would be even nastier to each other than they are normally, the commerce of the nation would be imperiled and the results politically would be too frightening even to contemplate. 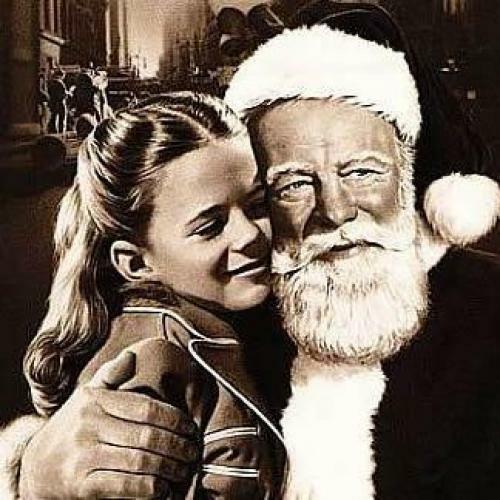 Miracle on 34th Street isn’t great art or high comedy, but it is good entertainment. Edmund Gwenn, a discriminating actor I’ve seen until now only on the stage (he made his first film in 1924 and has been acting in all for 52 years), plays Santa Claus. Next to his honey of a performance, the one to take home with you, wrapped in tinsel, is Gene Lockhart as Judge Henry X. Harper. The other characters worth watching are a little girl with a dream face who is only fairly well up on the intricacies of bubble gum, whatever she may think, and a fat 17-year-old boy who is being psychoanalyzed by an odd-fellow who does something about R.H. Macy’s personnel. The little girl is Natalie Wood, the young man is Alvin Greenman. As a group, child actors have acquired a phoniness rarely equaled by any other class of actors, but these two struck me as alluring. The picture starts with a handsome, meticulous old man, in a real beard, correcting a window-dresser who is arranging a display involving a sleigh and reindeer—Prancer is behind Dancer, or some such serious error. The old man wanders up to the Park, where some real deer, not a bit shy, flock to him. Then he proceeds to Seventy-seventh Street, where the Macy Thanksgiving Day Parade is about to start. The hired Santa Claus connected with it is terrible at cracking a whip, so our aged, helpful friend lends him a hand. Kris is outraged to discover that—cotton wool, red flannel and all—Macy’s Santa is tight as a mink. The whole of New York City awaits the opening of the Christmas shopping season, crowds line the street, a great illusion can be built or shattered—and Santa Claus is looping. Of course, the lady in charge, played by Maureen O’Hara, who is not what you would call an enterprising actress, hires Kris. He is a terrific success, Macy’s engages him for the whole season, and he starts practically running the World’s Largest Store. By sending disappointed customers to other stores to find what Macy’s doesn’t have, he wins their weary gratitude and business skyrockets. This drives the executives of Gimbel’s almost out of their minds, and the neighboring firms engage in a contest to become the emporium with the kindest heart. Miracle on 34th Street is almost all due to George Seaton, who wrote and directed it, John Payne, of whom it can be said that he seems amiable, plays the lawyer who defends the person and the idea of Santa Claus.